Publisher’s Note: “Mr. 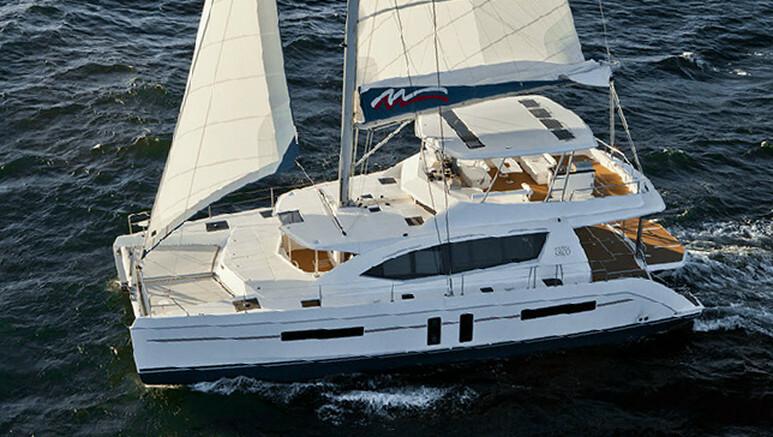 Free Spirit,” is the Managing Editor of Black Boating and Yachting.com. He is responsible for all content, writers and deadlines. Black Boating and Yachting.com will feature content on trips, boating safety, certifications, how to buy a boat, sailing, boating and yachting clubs, places to sail, boating manufacturers and a lot more. Mr. Free Spirit Planning Another Yacht Vacation for 2020! 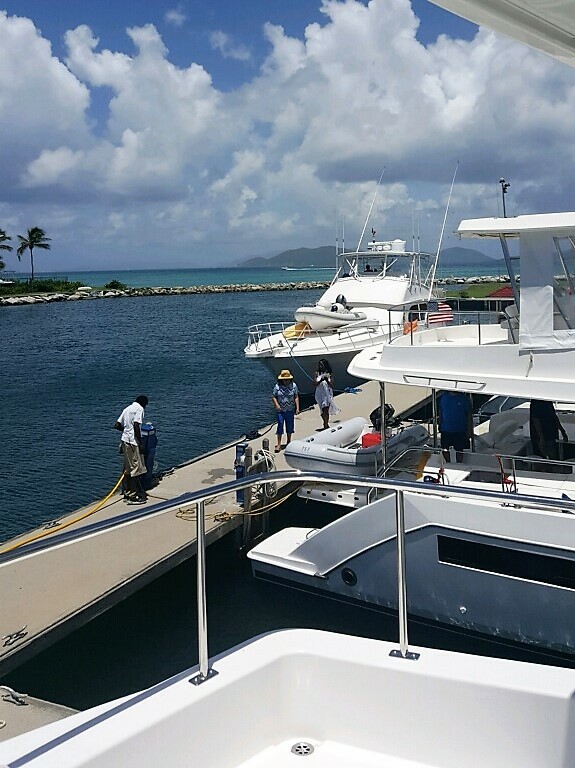 Hi, I am shocked at the number of people who have inquired about another trip to the British Virgin Islands (BVI). We are now in the planning mode for 2020. We scrapped 2019 to allow enough time for people to plan and gather funds to minimize any negative financial impact. We are working on a trip in July 2020. Many questions are coming in and we will answer them as we receive them. One question was asked about entertainment and the answer is “YES.” We will have entertainment. We are waiting for input from our Northern California Dream Girls. Location may not be everything but in the British Virgin Islands it’s what makes cruising so pleasurable. With its stretch of islands in the northeastern part of the Caribbean, charter guests can expect beautiful blue waters flowing into shaded caves and onto soft-sand beaches. Coral reefs surround the coast in an array of colors and are home to just as colorful marine life. Further inland bars, shops and restaurants spill through the winding streets and timeless villages are filled with the famous laid-back island ambiance. Welcome to 2019! Black Men In America.com Airlines welcomes you to our First Class Travel Program, where we will travel through 2019 with our final destination being the year 2020. Before you start this journey you must read and acknowledge our “mandatory” pre-flight agreement. This agreement is written in the form of a pre-flight announcement to make it easy for you to comprehend. My name is Gary Johnson. I am the Co-Pilot for this flight. On behalf of our flight crew let me welcome you to Flight #2020. Flight #2020 is a direct flight to being the best that you can be in 2019. Here at Black Men In America.com Airlines we always looking toward the future. We are concerned about your continued safety and care. To ensure that we have a comfortable trip, no “baggage” will be allowed on this flight. We ask that you bring only positive mental energy. You may use your imagination and follow along as we perform our safety demonstration. Please make sure that your thoughts and energies are in the secured and upright position at all times. All self-destructive and self-defeating thoughts and negative behaviors should be turned OFF at this time. To fasten your seat belt, insert the metal fitting into the buckle and adjust to fit snugly across your lap. Should you be called to get up and assist others simply lift the buckle release and you will be free to provide assistance. Please observe the lighted signs until they have been turned off by the Captain. The NO WHINING sign will remain illuminated for the duration of the flight and complaining is prohibited throughout the cabin. Should we lose altitude during this flight, reach up and pull down a prayer. Prayers will automatically be answered as they are activated by faith. This means that some prayers will be answered faster than others based on how you’ve exercised your faith, but rest assured, your prayers will be answered. In the event that we lose altitude or sustain an emergency, this aircraft is equipped with aisle path lighting which is located on the floor in the left and right aisles. Should cabin visibility be impaired, the exit path will be illuminated. Follow the white lights which will lead you to a pearly gate. Your name should be on the “Guest List.” If your name is not on the list, perhaps you have some additional work to do and this incident should serve as a reminder that you need to make better choices or some changes in your life. The beauty of this flight is that you still have time to take the steps necessary to get your life together and get your name on the “right” list. You still have to be kind, patient, caring and respectful. If you are kind, caring and respectful, there’s room for you on this flight. Kindness and goodness are renewable resources and we will use these resources throughout this flight. If you choose to behave otherwise, you will see red lights which indicate you have reached your final destination. You will not have access to an oxygen mask or a life vest. In other words, you’re DONE! The Captain (GOD) has cleared us for takeoff. The choice is yours. This may be your last chance to decide which direction you’re going to take in your life for 2019 before the cabin doors close. Thank you for flying with us—destination GREATNESS! I have many friends across the United States and through various conversations below provides some thoughts and efforts concerning the devastation of the recent hurricane season. We always take things for granted. Just think we celebrated 20 years of going to the BVI a couple of months a go in July and August 2017. Mr. Free Spirit had all new people and the experience was awesome. Plans were being made about what months we would do it again in 2018. At night, we watched the houses on the side of the mountains and the glimmering lights, we watched the car lights winding down the mountainside and discussed the regularity of brake jobs a car would need. We ate in restaurants that were basically outside, a roof, a bar, and tables. The people who live on the various islands were friendly and unique. Charmine at Moorings was waiting for my phone call to discuss my articles about 2017. Our Captains were fantastic and we had already told them the islands we planned to visit next year. I was going to write a recap of the 2017 BVI Reunion; the places we visited and the good times we had at each of our familiar, much-anticipated stops. But then Hurricane Irma and Maria roared across the Caribbean, turning the places we loved into piles of debris recognizable only by before and after pictures posted on Facebook. So instead of a day by day recap of “what we did on our BVI Reunion”, this will be a different take on the Reunion. It’s the story of what could have been the worst day and how it turned out to be the best. It’s a metaphor for what has already begun to take place all across the British Virgin Islands. 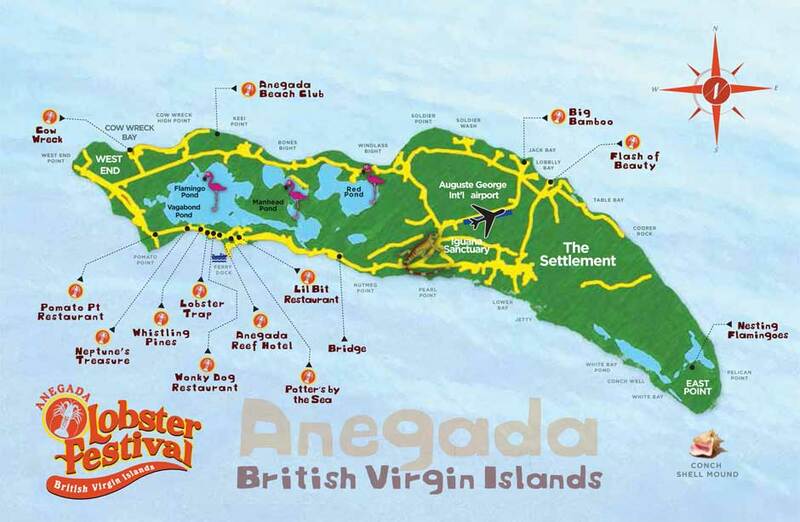 Since last year Anegada has become my favorite British Virgin island. As soon as I saw its beautiful blue water, cotton candy clouds and silky white sand, the small island became a magical place for me. I was reminded of the Yoruba Orisha Yemaja, whose signature colors are blue and white. If she had a favorite place to make her presence known, this place could be surely in the running. The flowing blue and white top I found while shopping for the trip would be perfect for the day, especially since I planned to join with a couple of friends to pour a libation in honor of our late friend Marvelle Manga. 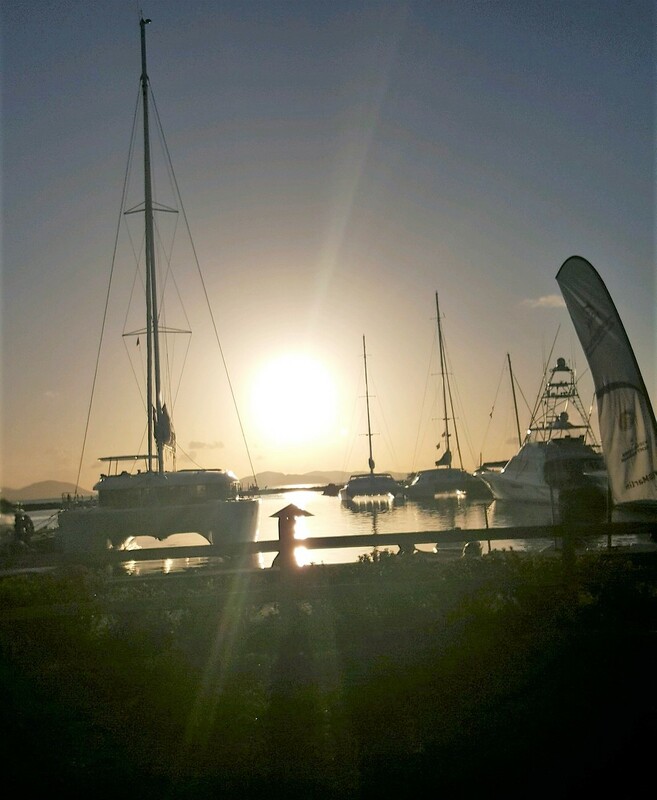 The morning of our sail to Anegada, the sun was shining, the sails were raised and the wind was in our favor. The crew of Otterside looked forward to liming on the beach and lobster dinner with the full BVI Reunion group later that evening. The perfect day was underway. Great conversations are a hallmark of our group – some serious; so some hilarious we couldn’t catch our breaths, and some “what would you do” scenarios. Last year someone posed this question: What we would do if our captain could no longer sail the boat? My answer: “grab Rhonda Gilbert – quickly!” To me, she has always been our first mate. So when Rhonda quietly and calmly asked another crew member to leave the trampoline and come back to the cockpit, something had to be up. When I saw her and Captain Andrew in a quiet conversation, I knew something was really up. As cool and calm as always, he told us we’d have to turn back. A strong wave jerked open the floor hatch in the salon, and water shot up from the opening straight up to the ceiling. After one quick fix, Captain Andrew took the wheel and turned Otterside back in the direction of Trellis Bay. We’re called “No Drama” for good reason. Nobody panicked. Instead, Geri McNair, our innovative master of meals, put together a quick lunch. This unexpected occurrence definitely called for Dark and Stormy’s and a glass or two of Malbec or Pinot. At Trellis Bay we lounged, laughed, talked, ate and drank. We took pictures of the Burning Man out in the water, waiting to light up the beach on the next full moon. Our Voyage tech arrived, and lying on what looked like a toddler sized surfboard, he slid under the boat and installed a brand new hatch. “We can make it,” Captain Andrew assured us. Once again, we were on our way to Anegada.. Out in the water, we spotted the British Royal Navy’s RFA Mounts Bay in the distance. Soon it drew close enough to sound its horn. I don’t know much about the “right of way” or “give way” on the water, but the sheer size of the Mounts Bay ruled. It sailed past our bow, on its way to somewhere in the BVI. A few minutes later, sullen gray clouds puffed up ahead. Thin sheets of rain fell, but we chose to watch the weather outside, sheltered by Otterside’s wide cover. It was a scene too beautiful to miss. As we sailed through the rain, the spectacular scenery merged – a sheet of rain on the starboard side, clear skies up ahead and a rainbow on our portside. At dusk, just before we caught our first sight of land, the flaming ball of sun descended slowly into the sea, framed on either side by a long gray curtain of rain. 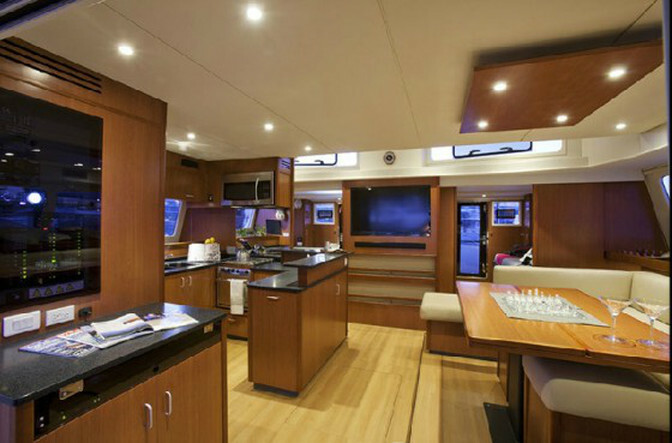 I stood in the galley, watching Otterside ride the waves through the channel into Anegada Harbor . We had come through a rainstorm into a rainbow, a metaphor for the destruction and rebirth we had no idea would come in less than a month. 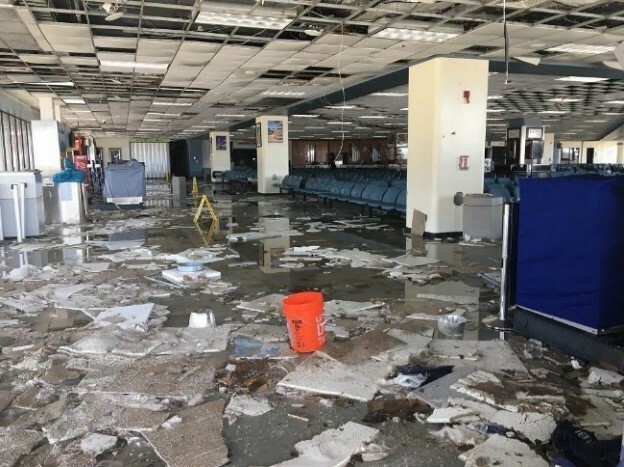 Right now, there is still widespread devastation across the British Virgin Islands. For many days, people searched frantically for unaccounted relatives. There was no power and few means of communication. People who sheltered elsewhere returned to homes that are no more, with no means to earn a living.. But gas stations, grocery stores and banks are opened, even if supplies and hours are limited. The RFA Mounts Bay that we encountered on the way to Anegada has returned, along with the HMS Ocean to provide aid and supplies to the devastated islands. The Puerto Rican Navy came through in a major way. Sadly their island has now been struck by similar Some restaurants are open for business. Others have set up stands to offer free food. One of my friends returned to her destroyed home to retrieve whatever belongings she could. Outside she found a small green shoot that had begun to grow on a tree limb. That to me is an indication that the British Virgin Islands is on its way to rebirth, and that they will emerge #bvistrong for certain. I can’t believe this level of destruction has never been seen in these islands. Homes demolished, while others are severely damaged. The landscape unidentifiable in some places throughout the town and country areas of Tortola. Vehicles littering the hillsides among pieces of galvanize and wood and glass and all types of debris as if the unruly hurricane just decided to turn the whole island into an over-turned waste basket. Everything that could have gone wrong went wrong. 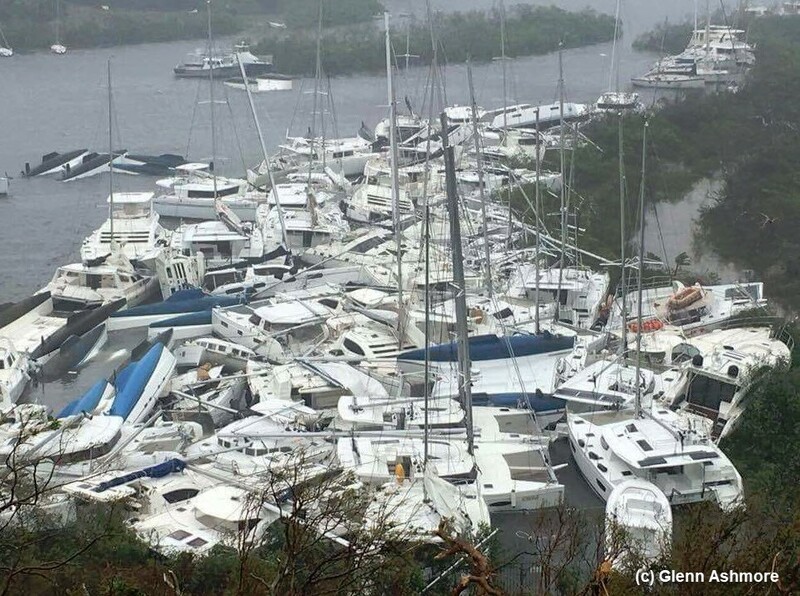 Hurricane Irma slammed into the British Virgin Islands. Wandering around Tortola, the largest of the islands, the scale of the destruction is clear, even after a week of rebuilding. Thousands of homes here have lost roofs and walls, revealing rooms containing the possessions of the displaced residents. Electricity and water services are patchy, while cables hang loose in the wind. JOST VAN DYKE, B.V.I. — This little island draws boats from all around the globe to its powdery beaches and ebullient bar scene. Thousands of visitors come for the boisterous New Year’s Eve celebration at Foxy’s — a wooden beachside bar decorated with the license plates, dollar bills and flags that visitors have left behind since the 1960s. 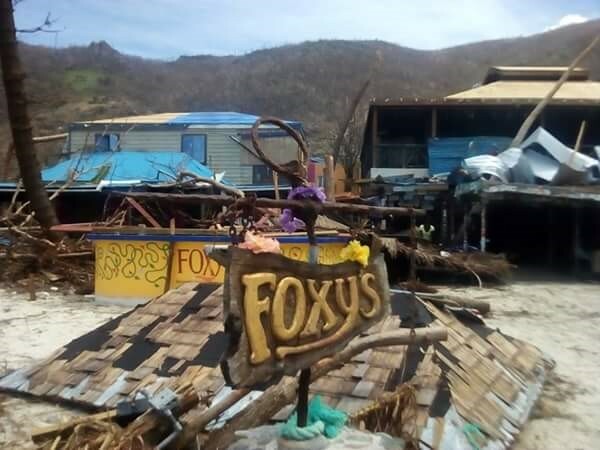 But after Hurricane Irma’s winds annihilated many of the homes here on Jost Van Dyke, one of the British Virgin Islands, Foxy’s Tamarind Bar and Restaurant has become something else entirely: the island’s de facto command center and lifeline. Without electricity, running water or telephone lines, the island’s 298 inhabitants have been marooned, forced to survive with what they salvaged: a satellite phone, a chain saw, a week’s worth of food. There is little to no government presence on the ground, but there is Foxy’s — which has some of the island’s only generators. Beneath the bar’s tattered roof, residents ration supplies and cook meals twice a day for most of the island. 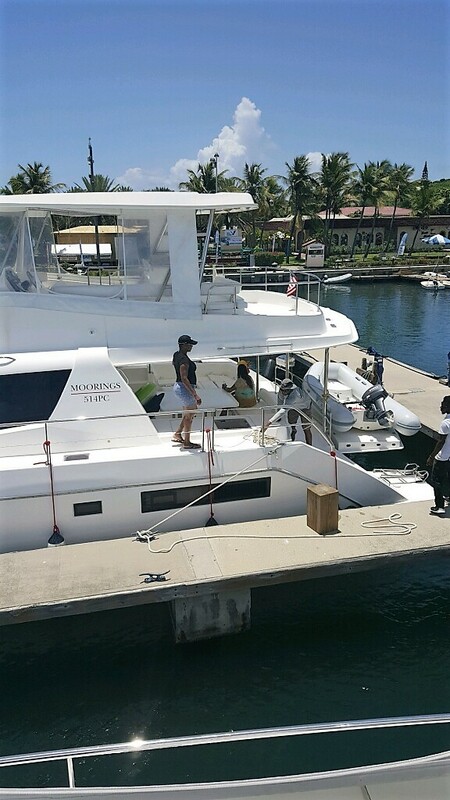 We had entrepreneurs on our boat and arrangements, negotiations were in place to distribute products. We had planned the development of future trips to introduce other family and friends, the end of an era. I’ve tried to find our Captains to no avail, however, we do have information about the two Captains that I’ve known for years and both are safe but can’t get home. Below is the information: https://www.gofundme.com/captain-kenroy-hazell. Click here to support Andrew Cooper’s new beginning! organized by Deborah Fanning. Ms. Bev said they both captains have gone beyond the call of duty for E-Dock & Friends. Anytime I’ve ever asked Kenroy or Andrew for assistance for whatever I needed to carry out a planned activity, I knew that I could depend on them. Now it’s time to let them know that they can depend on us. 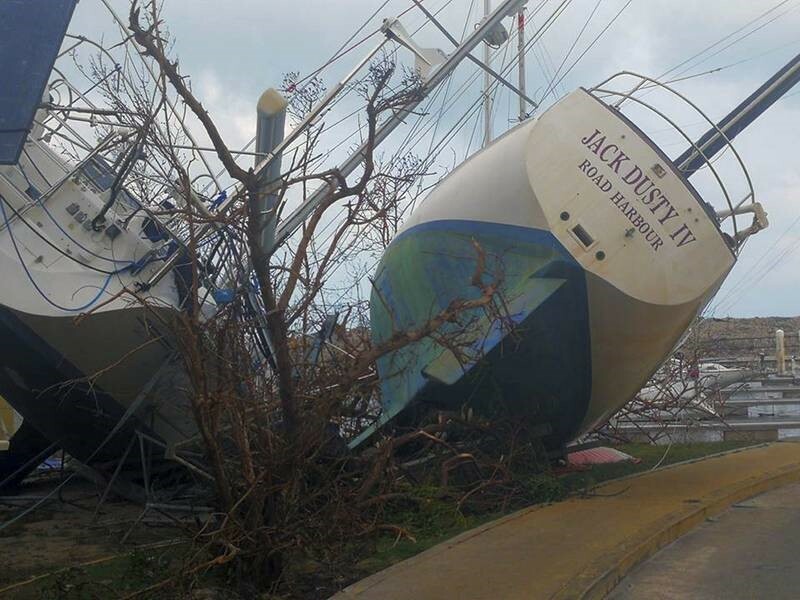 Many of us wonder, beyond providing immediate funds, what can we do to help our beloved Captains, friends in the BVI, and our brothers and sisters in the Caribbean long-term? Remember Hurricane Katrina? Many who evacuated from New Orleans never returned. The rebuilding process took time, physically, emotionally, and spiritually. However, we must stay hopefully and put our time, talents, and energy toward lending a hand in whatever way we can. Pebbles Fagan is considering organizing a group of public health graduate students and partnering with an organization to help rebuild. She is in the process of investigating how she can create a service learning class so that her public health students can help rebuild in some way. I totally agree with Pebbles, let’s do something, we always wait and watch for the Government’s to do something, However, since we know many of the people, it’s time to act and stop watching from the sidelines. Please contact Pebbles if you want more information (pebblesf@hotmail.com). 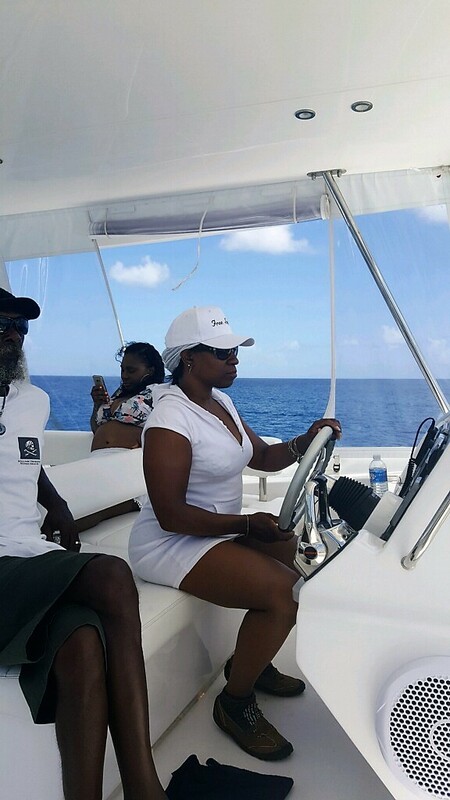 Other boaters have also talked about what can be done long-term to help those in the Caribbean who have been so kind and hospitable to so many of us? Please consider how your special talents and gifts can best be used to help those who have lost all, but still have their lives. Photo: Ad Williams (Center) at the steering the vessel safely through the water. Well a new development has occurred. Did you know, this will be the largest gathering of Black Boaters/Yachters in the history of Black boating? 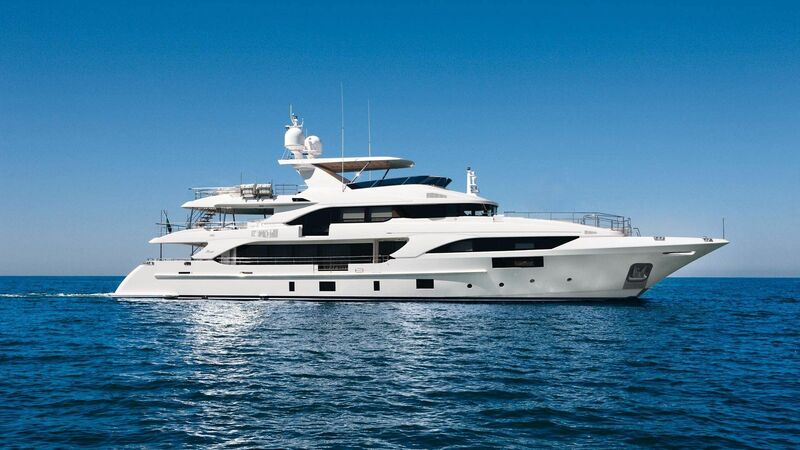 We are not talking about the events on the cruise ships, we are talking about private yachts. This event started with one (1) welcome party July 28,2017, it has grown to three (3) welcome parties one July 27 and two (2) July 28th. I remember my first trip in 2008, I was fascinated with the collaboration of that number of Black boaters. We had qualified Black Captains from the United States. 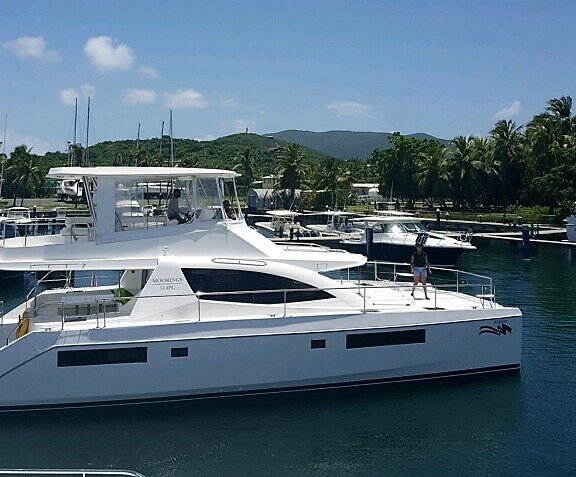 I am now amazed at the numbers of both the experienced Black boaters and the new people that want to enjoy the experience of renting a yacht and cruising the British Virgin Islands (BVI). Blacks are more aggressive consumers of media and they shop more frequently. Blacks watch more television (37%), make more shopping trips (eight), purchase more ethnic beauty and grooming products (nine times more), read more financial magazines (28%) and spend more than twice the time at personal hosted websites than any other group. Blacks make an average of 156 shopping trips per year, compared with 146 for the total market. Favoring smaller retail outlets, blacks shop more frequently at drug stores, convenience stores, and Dollar stores. The overall results are very revealing. Many of the articles in BMIA are intertwined. Read the articles about entrepreneurship. Can you imagine a Black Photographer and/or Videographer investing in going on this trip? What would be the Return on Investment (ROI)? Since history is going to be made on this trip, can you imagine the ROI? This does not include all the people and the tremendous efforts on their part. During a conference call between Mr. Gary Johnson, Black Men In America.com and Mr. Free Spirit a decision was made to document this historic event with a pictorial and/or video slideshow. Representatives of Black Men in America.com will work with participants after the event and assess the available photos and film to determine the best method of documenting the event. This will be a collaborative effort coordinated by Mr. Free Spirit. Well it’s almost time, just think this trip has been in the planning stages for a year. It is now time to start packing, checking the location of your passport and notifying your credit card companies you will be out of the United States. The final list of activities is limitless and sleep will be a rare commodity. 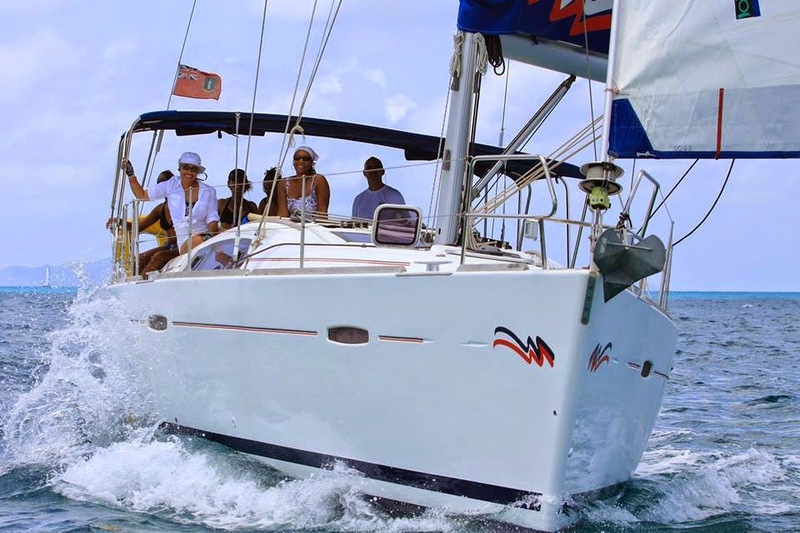 Can you visualize yachts of African/ American’s sailing the blue waters of the British Virgin Islands (BVI) together? The events will be endless and loaded with fun. Just think, beach activates, pool parties, Regatta Sailing Race, snorkeling and all the other activities. Pebbles said: Like the Jackson’s………”I can feel it”…we are going to have the best trip ever! Questions are coming in from the newbies? This may help you. The average temperature is 85-95 degrees daily. This vacation is very casual. Do not over pack. light summer wear, swimwear, cover-ups, shorts, tops, Capri’s, t-shirts, flip flops, scandals, shower shoes, sun visors, hats, sunglasses, sunscreen, lotion, mosquito spray with deet, trunks, short sleeve shirts, back pack, extra beach towel, camera, games and music. Decorations for the boat. Pack (1) White outfit for the party at the BEYC. Pack a grass skirt or Hawaiian something for our theme party at Virgin Gorda. All medications, personal documents and valuables should not be packed in your luggage, but hand carried. Leave a copy of your passport and driver’s license number with someone at home. Emergency phone numbers to leave with someone at home: Do not bring lots of cash. 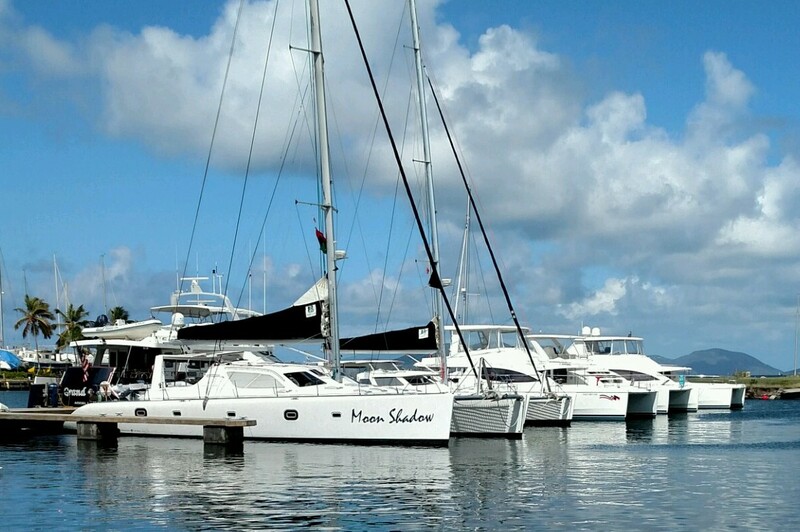 Most places in the BVI accept major credit cards. Do not bring valuable jewelry. Make sure your luggage is tagged right when checking in at the airport. Make sure the boat is locked when unoccupied. Be extra careful stepping on and off the yacht. Wear life jacket when on the dinghy or in rough water. Be extra careful when cooking on board. Cell phones work in the BVI but are very expensive. Check with you cell phone company before you go to see if they have a temporary plan for you. You can also rent a minute phone while there and add minutes as needed. Don’t forget your phone charger and/or a good camera! There is no other place like it anywhere in the world. And certainly, no other place like it if you’re seeking a true British Virgin Islands vacation. A casually elegant British Virgin Island resort and spa hidden away on an 1,800-acre oasis of tranquility. 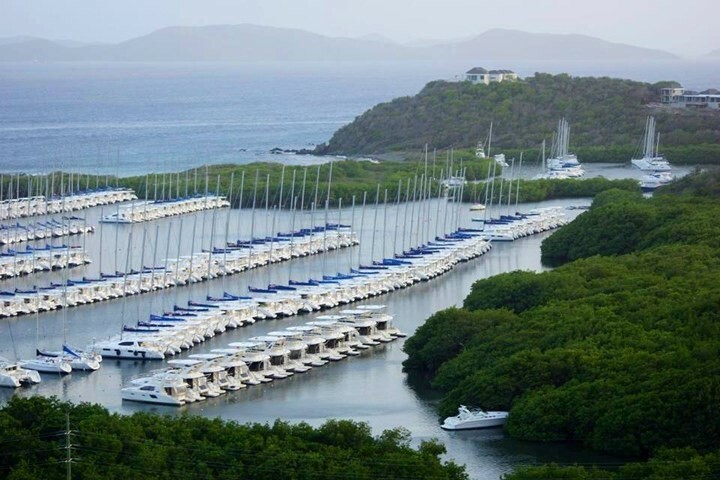 Adventure and luxury living set within the magic and beauty of the British Virgin Islands, Scrub Island Resort, Spa & Marina is your own pristine secluded island retreat. You’re not looking for an average vacation. Good. This is not your average place. Divine secluded beaches. The clearest of waters. Boundless adventures on and beyond our breathtaking shores. A variety of wildlife special to the Virgin Islands area thrive on Anegada, including loblolly, frangipani, turpentine trees, feathery sea lavender and wild orchids. On the nature trail at Bones Bight, catch a glimpse of the rare rock iguanas native to the island, or discover the exotic birds at Nutmeg Point. Snorkelers and scuba divers will delight in the reef’s mazes, tunnels and drops, which are rich in needle fish, bonefish, stingrays, parrot fish and other marine life, while those with sea legs will enjoy water sports, sport fishing and bone fishing. Beachgoers will find no lack of calm and quiet shores, including Cow Wreck Beach, Flash of Beauty, Bones Bight and Windlass Bight. Discover Anegada’s history through a maze of stone walls that surround the Main Town’s Settlement or the Arawak’s ancient conch mounds in the East End. Or, explore the wreckages of numerous Spanish galleons, American privateers and British Galleons. This is the last article before the trip, Mr. Free Spirit will send pictures back during the trip for publication and the Sept article will be the trip summary. I did receive a call asking is there any room left for a late comer, the answer is, YES but it is limited. The power side only has ONE cabin available, I am not sure about the sail boat side. Well time is really getting close and this reunion will be one for the history books, who ever heard of this many people of color having a boating reunion? You can’t imagine the efforts in the planning of a reunion of this magnitude, the logistics related in the movement of this many people is a task that is bigger than big. The planning committee has really put a great deal of time and effort to make this venture a unforgettable venture. Many new things are occurring every day. If you are trying to make your decision about going on this reunion, ACT Now!!! Some of the Yachts may still have some cabins left. After hearing from some of the groups many new features have been added and the earlier features have been enhanced. 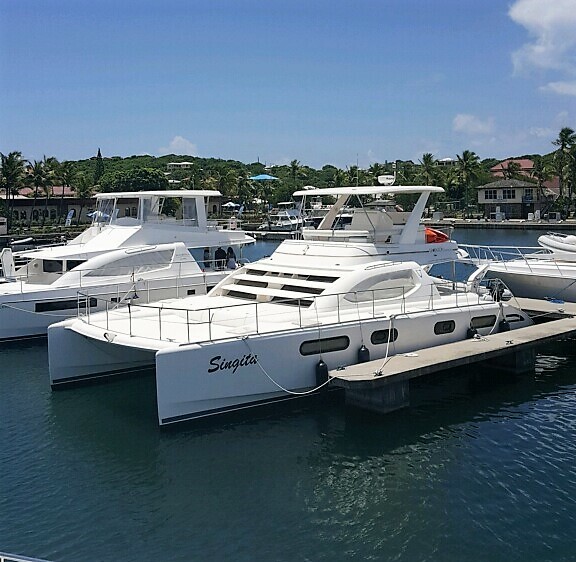 ​The adventure will begin with two Welcome Parties, one at the Moorings hosted by Joe Banks, and one at Soper’s Hole hosted by “No Drama Vacations”. ​Music and food will be on tap for a fun-filled evening before the voyage. Out of the gate Mr. Free Spirit is having a pool party which will be followed by an afternoon beach Bar-B- Que organized by Capt. Ken Washington & Capt. Craig Martin at Spring Bay. Let the party start. 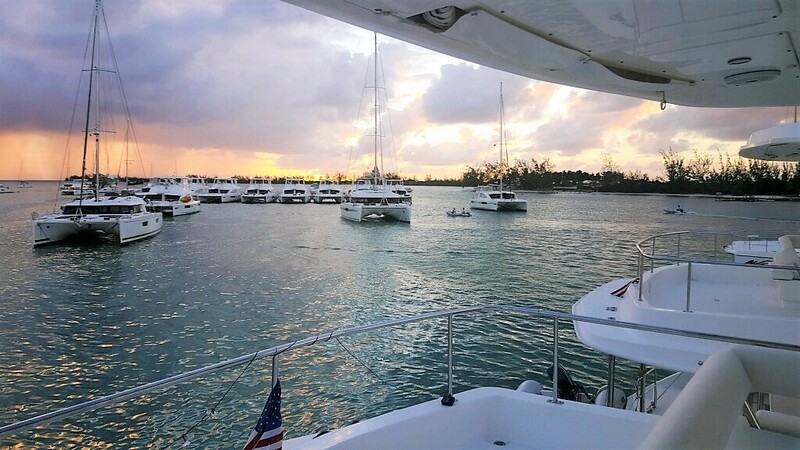 All the yachts will meet at Anegada for dinner. Can you imagine all of the yacht’s in one place at the same time? 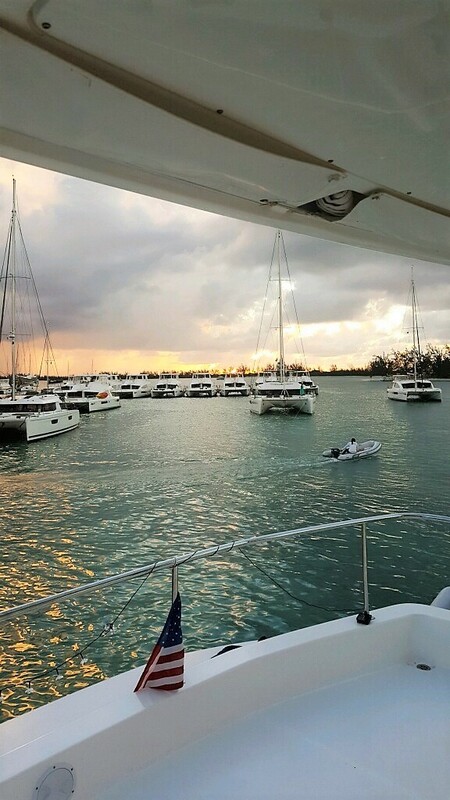 After leaving Anegada, the yachts will sail to the Bitter End Yacht Club to attend the “No Drama Vacation” Black and White Party, or cruise to Leverick Bay for dinner & DJ, hosted by Joe Banks​. Joe Banks and his group is having the dinner of all dinners at Nanny Cay, this is the location where everybody will say good bye to the new friends you met from other cities. The Nanny Cay event will be held at the “Peg Leg’s” restaurant. Besides an extensive buffet menu and a cash bar, they will have a DJ for entertainment and we also plan to take group pictures there at that time. The event promises to be a fun one and the last night on the Island for several of the groups in the Flotilla. For those who want one more event Shaun Brown and crew will have a WHITE party at the Ritz Carlton hotel in St. Thomas VI. Mr. Free Spirit OUT!! There is only one way to avoid criticism: Do nothing, say nothing, and be nothing! As you know I have been sitting in on the national planning committee conference calls for the 2017 BVI Reunion. I must say the conference calls are very detailed and packed with enthusiasm. Many thumbs up to the people around the United States for the time, research and effort they are extending to make this a trip to go into the history books. It was my intent to develop a repository of events being presented by the different organization, however the list of events is just too long and to fluid for me to list. One of the main questions is: How many boats and people are going? I lost track at 50 boats and stopped counting. There is both a Sail Side and a Power Side and tracking the many events will be difficult to reflect. I feel blessed to be covering this event and during a conversation with a planning representative from New York I stated this reunion will be a true fishbowl. With our current political environment, a chance to portray the ability of people of color to do something positive is a real plus. Since I will be traveling on the power boat side I am more familiar with their itinerary, and it is power packed. E-Dock is still adding events. They have people traveling from California, Maryland, Florida, Michigan, Georgia, Arizona and Hawaii to make this trip. Since most of you won’t know me, that gives me a chance to interview you for www.blackmeninamerica.com without you knowing it’s an interview. The opportunity for people of color to meet people from other walks of life will be fantastic. My current column on what it takes to be an entrepreneur will play a big part in the reunion interviews, based on the concept of JUMP! 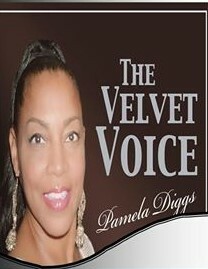 The black boaters have played a BIG part in our thoughts to enlarge Black Men In America.com. We are currently on the drawing board making major moves to expand. A section on black boaters will be included in the expansion. There is a difference between EXTRA and EXTRAORDINARY. The 2017 British Virgin Island (BVI) reunion falls into the category of EXTRAORDINARY. Based on some the plans that have been provided to me this will be a reunion that will never be forgotten. Boating clubs around the United States have been invited and the response appears to be great. Let me give you some insight. I attended a small flotilla of boats in Aug 2016. The point of departure was Tortola, British Virgin Islands. The natives greeted me by saying “Welcome to Paradise” and as the week went on I found this statement to be true. I was also told this would be a group of like-minded people and it was. The 2017 reunion is of special interest to me for political reasons. The current political environment portrays black people in a very negative manner. I really don’t have time to watch TV, however; when I do it is depressing. The world is viewing black people as uneducated thugs without a brain and the word racist has now become a normal part of peoples’ vocabulary. The positive things that we do as a race is never recognized. During my conversation with Ms. Bev of Metro Detroit, Michigan, my mouth flew open when she stated she has been living the boating lifestyle for over 40 years. Additionally, she talked about the number of black female Captains (they own their boats) in the Metro Detroit area that are boaters. Again, something positive. We also discussed the women in Cleveland, Ohio who are also boat owners. A general thought pattern that has been discussed in the white community is “black people don’t go near water,” and that “black people are scared of water.” Both thought patters are false. The 2017 reunion is shaping up to being the largest boating reunion of all times and it may never happen again. It will be the ultimate FISH Bowl, meaning people from all over will be watching and some of them will wishing they were there. I am and will watch the list of boating club’s numbers and publish them in a general manner. However, I will be mindful of any intrusion of a club’s privacy. I will never include any boat club’s prices or itinerary in my column. According to the confirmations that I have received so far, the Black Men In America.com boat is FULL. Keep in mind, FULL is not FULL until the money is PAID IN FULL. 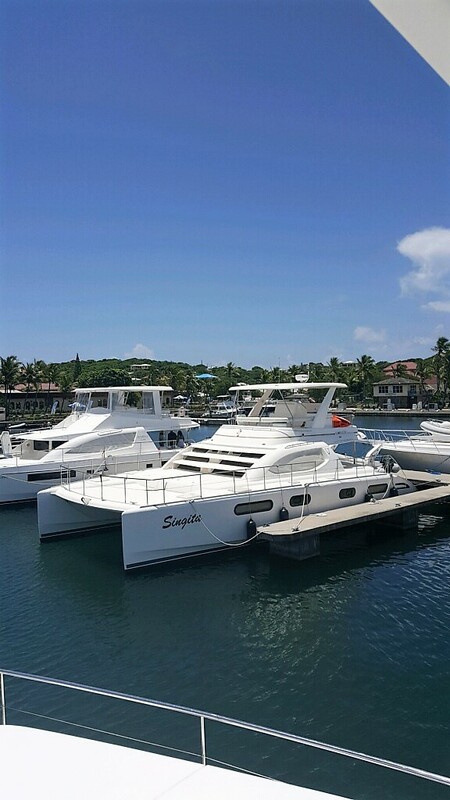 We have the option of acquiring a second boat. There are 8 people to a boat, double occupancy. 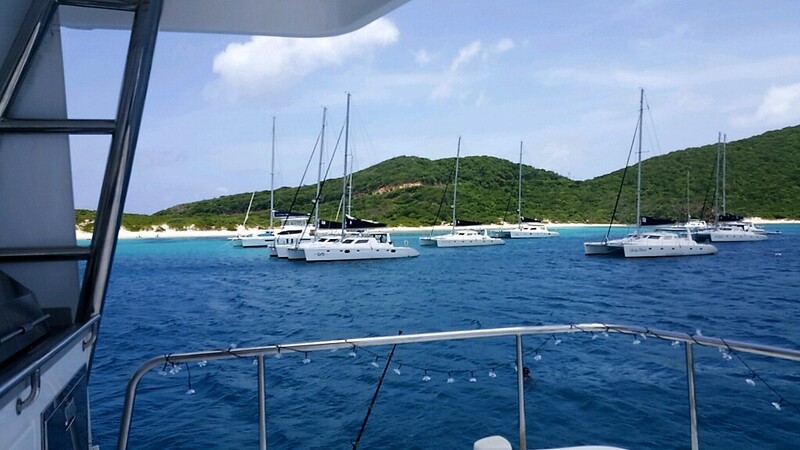 During my 2016 experience with boating in the British Virgin Islands (BVI), some extremely positive things occurred. All of the partying was awesome. 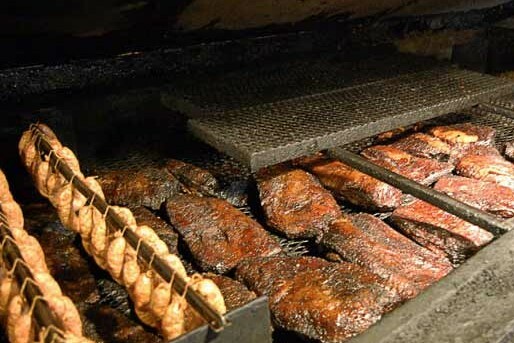 The food and the process of catering to who eats what was enjoyable also. One aspect of the trip that I found stimulating was the round-table discussions lead by Doug. I won’t provide the subject matter because I will save that for next year. The impromptu “Soul Train” line in the pool at the Baths is something that I will never forget. We had people from so many cities and everyone got along. This was a drama free experience. We lived together on a boat for days without incident. 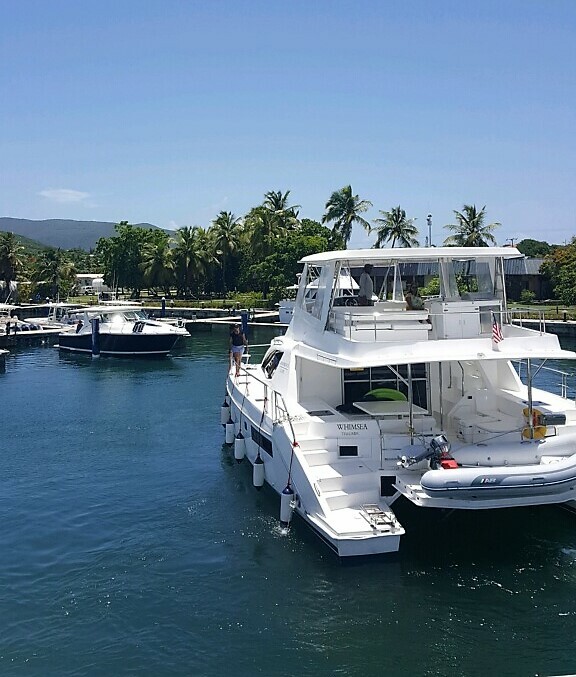 The pricing structure for 2017 will be completed at the boat show. The Black Men In America.com price and itinerary will be sent via email only. If you are interested email me at mrfreespirit@yahoo.com. Upon the receipt of your deposit all of the information you need will be sent to you as each club operates differently. The 2017 British Virgin Island (BVI) reunion is moving further into the category of EXTRAORDINARY. Based on some of the plans that have been provided to me thus far, this will be a reunion that will never be forgotten. Based on the information I’ve received; this will be an unforgettable experience. If you miss this BVI reunion written words will never be able to describe it. As I watch the people doing the planning of this reunion I can only say that they are doing a fantastic job. To list the events that will occur during this reunion would take too much time and I know I would omit something. As I coordinate the events for our boat I realize this is mind blowing, so I can imagine what others are doing. I can only hope that each group decides to have breakfast late each morning due to the extensive list of activities available. The method of itinerary distribution is at the discretion of each group organizer. For Black Men In America.com we will provide the itinerary via email to those going in our group. Every detail is being reviewed to have this trip smooth. I rarely get mesmerized, however some of the boat/yacht clubs for the BVI reunion have people coming from all over the United States. 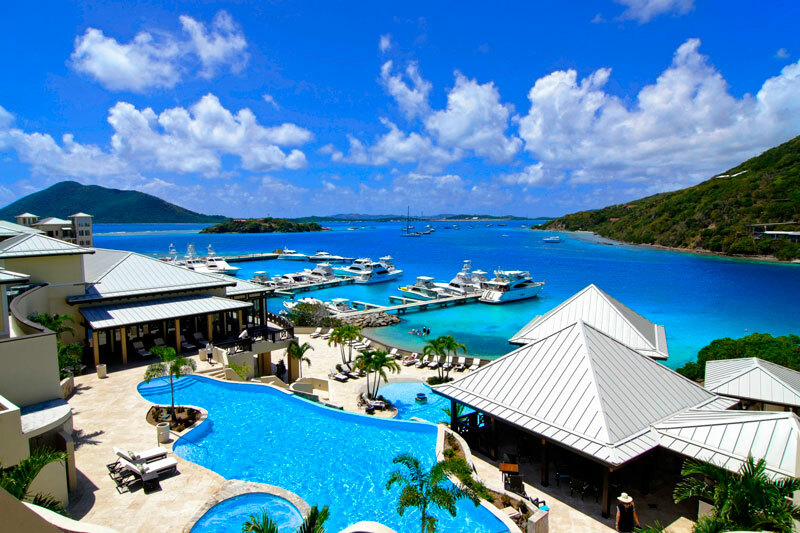 I went online to research the room rate per night at a yacht club in BVI that we will visit and it was $ 1,000.00 USD per night. I attended a party this year held by E-Dock/Ms. Bev/Metro Detroit and I was always told “stepping” in Chicago was a way of life and nobody could touch them. Well, Detroit was really in the house. You know being the new kid on the block, observing this effort is a sight to behold. I must commend all of the individuals’ doing the planning. The job you are doing is fantastic! It is almost impossible to write about all of the things going on. I will say if you attend this reunion you will need a vacation upon your return home. From what I see every detail is covered, they plan non-stop entertainment and activities throughout the day and night, there’s more than you can possibly do on a single week! Whether you’re traveling solo, with a friend, family member, or significant other, the 2017 BVI has fun activities for everyone. I have received some interesting questions about this trip. Let me help you! You know that fancy luggage you have? Leave it home. There are some wonderful duffle bags on the market and it will be easier to store. Where do you apply for a US Passport? You can apply for your US passport at many post offices, selected regional federal buildings and at some circuit court offices. The easiest way to find your closest passport application acceptance facility is to go to the State Department’s website and search by ZIP code. The search form allows you to select handicap access sites and find nearby locations where you can have passport photographs taken. This BVI reunion has inspired the Gary A. Johnson Company to publish a new online magazine that caters to black boaters. A preview of the content can be found at this link: http://blackmeninamerica.com/black-boating-and-yachting/. The online mag is tentatively scheduled for publication in November 2016. All boaters are invited to submit articles for publication. More information and submission guidelines will be available next month. When looking back doesn’t interest you anymore you must be doing something RIGHT! 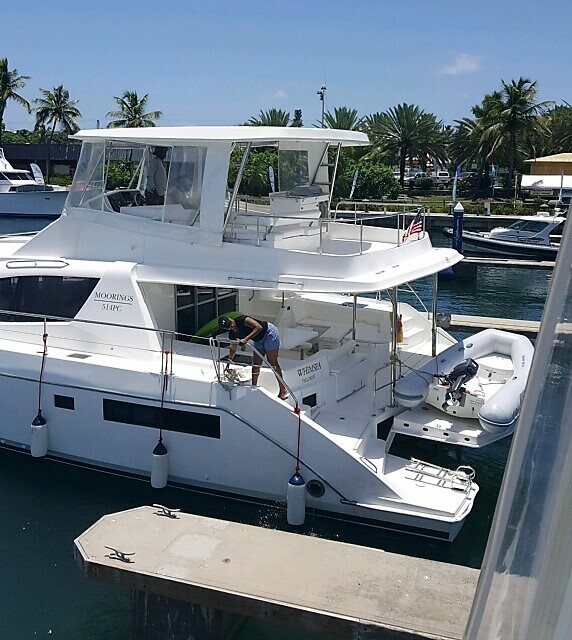 Hey Buddy!, I found this information for you: "BLACK BOATING AND YACHTING". Here is the website link: https://blackmeninamerica.com/black-boating-and-yachting/. Thank you.